We were fortunate to be invited to the family home of a young Nepali friend called Biny Chapagain, to join their special festivities on 14th October and they kindly explained all about their celebrations. Dashain is a two week festival held during October. On the first day barley seeds are planted in a container in the home, and these are watered and looked after for 10 days. 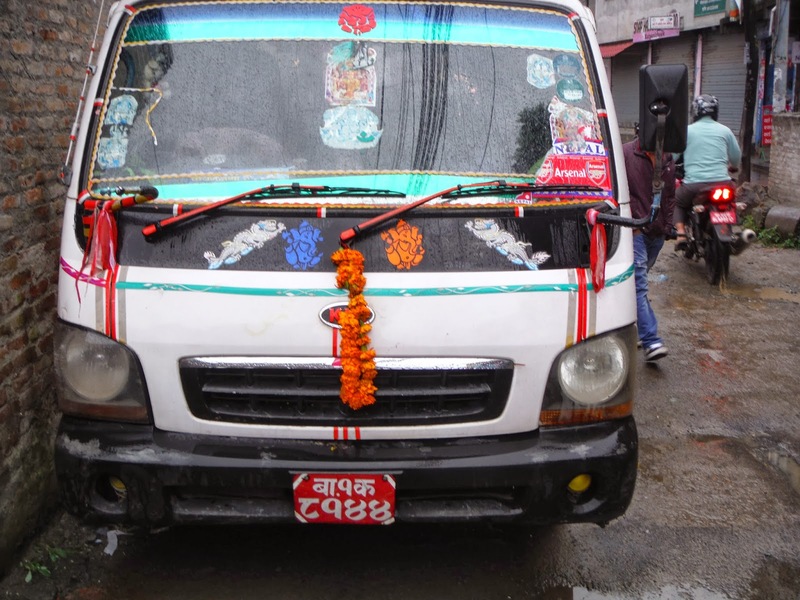 On the next few days different things are blessed including vehicles, which are adorned with ribbons, garlands of marigolds and sprinkled with red powder on the front. We even saw dogs with red tikkas on their noses on another day. 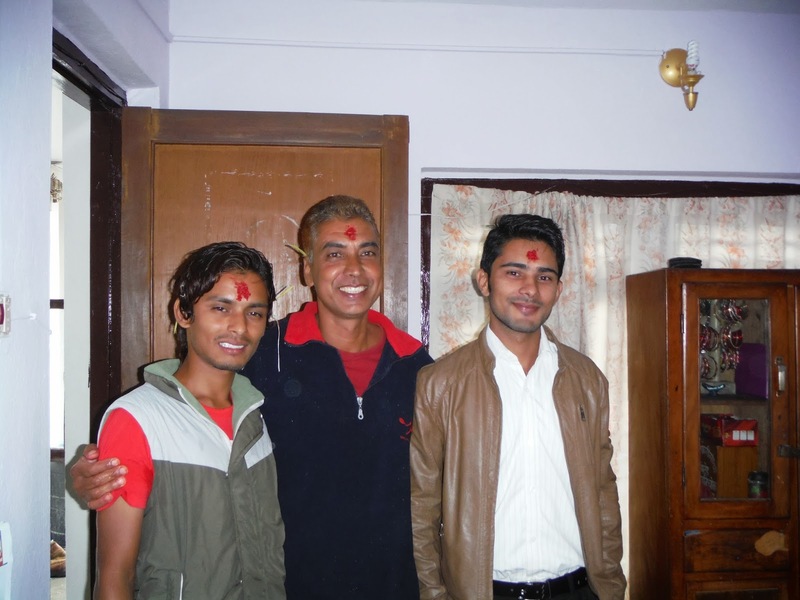 The main family celebration starts on the 10th day. On this day families dress in their best clothes and do ‘puja’ (family prayers) with everyone sitting on the floor, even elderly people. Then at the auspicious time, around 9.40am this year, the oldest/most senior family member places on each member in turn, in order of seniority, a tikka (red paste mark) on the forehead and pieces of sprouted barley in their hair. There is a personal blessing murmured for each person whilst this is taking place, and then each is given a piece of fruit, something sweet like dates or chocolate and an envelope with money in it. 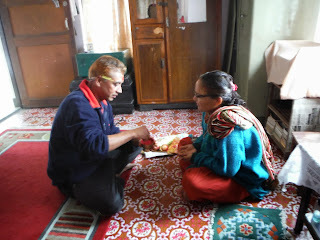 (I asked what was said for my blessing and Mani told me he was asking the gods to help me with the work of improving education for girls in Nepal.) The tikka paste is made from red vermilion powder, rice flour and yogurt. 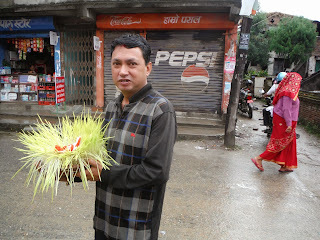 Food and drinks are then offered to everyone after the ceremony. We were given a delicious meal of curried mushrooms, spiced meat, rice and spicy-hot pickle. 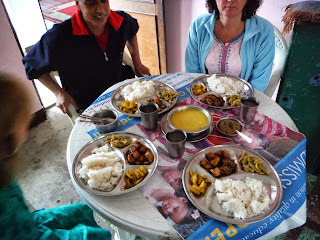 We had chiyaa (Nepali sweet tea), coffee and water to drink. After lunch we went with our friends to visit their family members, including to the 90 year-old grandmother, who presented us with a tikka, despite her age. During the day families go to visit all their relations in turn, and at each house the tikka ceremony takes place again, with more food and drink to follow. It is considered impolite to refuse the food, so you must try a small bit, even if you are already full. 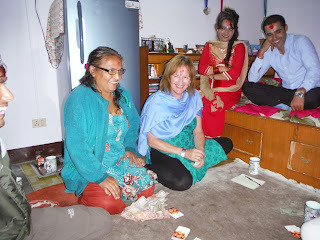 Another tradition is for families to play cards, and to bet money with the hope of winning. 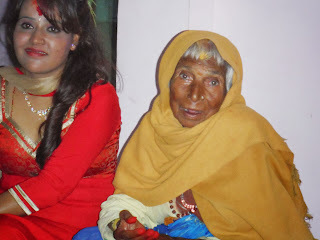 Gauri, the mother of the family we visited, played well/ was lucky and won a considerable pile of low value notes. It was very good-natured and we had been warned to take lots of low value notes for this purpose. Gauri with her winnings from card gambling. 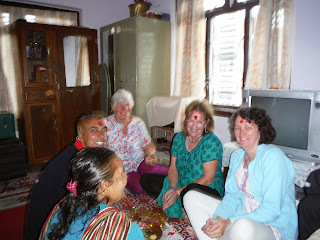 At every house we visited we were made welcome, although we were the first foreigners ever to have been to their homes. One aunt and uncle actually wanted us to stay the night at their house, and went as far as to show us the bedroom! By the end of the day, we didn’t leave until after 8pm, we had been given about five tikkas and eaten a great deal. 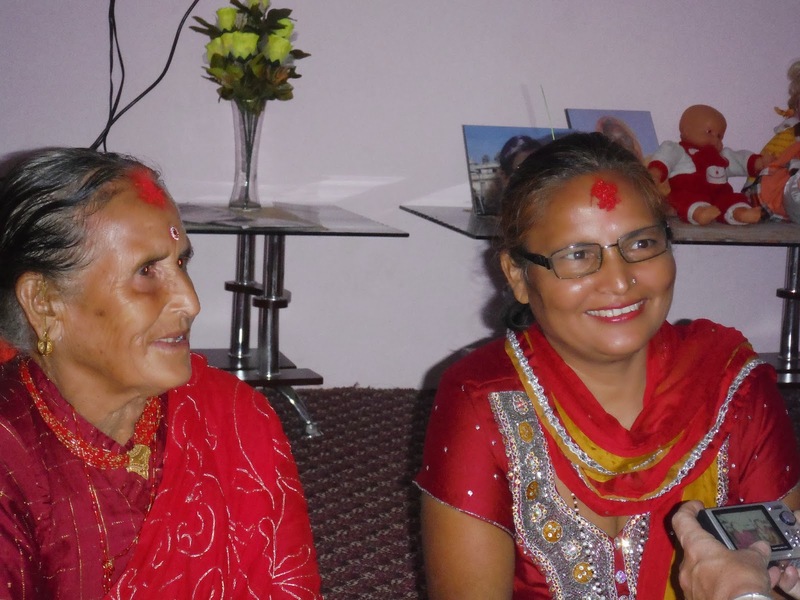 How lucky we were to have been included in this traditional celebration with such a kind and generous family.